Today, we’re launching Fund on Etsy, a crowdfunding pilot program to help Etsy sellers grow their businesses and create new products. By funding a campaign, buyers can participate in a new product’s journey from initial concept to their front door, while forging even more meaningful relationships with Etsy sellers they care about. Fund on Etsy is a way to expand the Etsy Economy, where creative entrepreneurs find meaningful work and thoughtful consumers discover and buy unique goods while building relationships with the people who sell to them. Over 10 years, we have learned how sellers work from beginning to end to bring products to market, and have developed products to serve their needs along the business spectrum, including tools to create and manage listings and payments, promote items, track orders and expand into new channels like wholesale. Fund on Etsy is intended to address another need — financing and product development — and fits in seamlessly with sellers’ business lifecycles. Over the past few years, crowdfunding has emerged as a viable and friendly alternative to traditional financing channels for many creatives around the world. We believe that crowdfunding on Etsy is a natural way for sellers to forge even more resonant connections with their existing communities and customer bases and to grow in ways that may not have been possible before. Fund on Etsy can also expand the breadth of products buyers can find in our marketplace that they can’t find anywhere else. We are launching Fund on Etsy as a US-only pilot program that will run from June 16 to August 16 and have selected a limited group of sellers to launch campaigns throughout this period. Sellers in the pilot program have been working diligently over the past two months to develop new product ideas that will help them get closer to achieving their business growth goals. The campaigns they’ve created range in scope, goals and products, illustrating to buyers how their funding will help them take their business to the next level. Fund on Etsy. Credit: Etsy Inc.
Fund on Etsy is crowdfunding for creative handmade products. Funds raised through these products enable sellers to grow their businesses in various ways, from studio expansions to purchasing new tools to hiring a helping hand. Growth means different things to different people, and we believe Fund on Etsy will allow sellers to continue to grow on their own terms. Take Araya Jensen from Wind and Willow Home. A mother of two, she opened her Etsy shop to sell modern housewares after she was laid off as a designer. Now, she’s aiming to raise $4,500 to develop and produce a new line of beautifully hand-marbled wooden plates. “I am excited to have this crowdfunding opportunity to fulfill my customers’ needs and introduce a line of wooden plates!” says Araya on her campaign page. Etsy seller WindandWillowHome. Credit: Etsy Inc.
Katty Huertas from Katty’s Handcrafts has always focused on creating knitwear accessories, but she’d love to also start making and selling ceramics, which she studied as an art major. In order to create a new line of ceramic cups, she wants to raise $350 to cover the costs of materials and membership to a ceramics studio. “My goal with Fund on Etsy is to be able to expand my product line, grow my brand and keep busy during the whole year doing what I love,” says Katty. Etsy seller KattysHandcrafts. Credit: Etsy Inc.
To develop a new collection of first-edition bags, Tielor McBride from TM1985 hopes to raise $10,000, which will cover the cost of creating product samples and refining the production and design process. Tielor, who sources his materials in the US, sketches his bags by hand and thoroughly field tests each one. “We’re able to present an idea to our established community and introduce ourselves to a larger audience all while expanding the brand and receiving feedback before we’ve even begun production,” says Tielor on his campaign page. Etsy seller TM1985. Credit: Etsy Inc.
After the pilot program, we’ll be looking at buyer and seller feedback to determine what’s next. If you like the idea of crowdfunding on Etsy, the best way to show your support is by helping fund one of the inspiring campaigns that have already been created. Also, tell us what you think. We’re always looking for new ideas to help our community of buyers and sellers connect in meaningful ways. Fund on Etsy is part of that vision, and we’re eager to share it with you. This is a journey not just for our pilot sellers, but also the greater Etsy community. Let the journey begin. 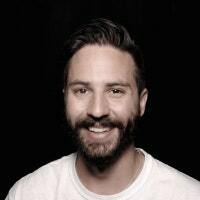 Joe Lallouz is the Head of Pattern at Etsy. He works with his team to continue making Pattern an even better way for sellers to take their creative businesses to the next level.